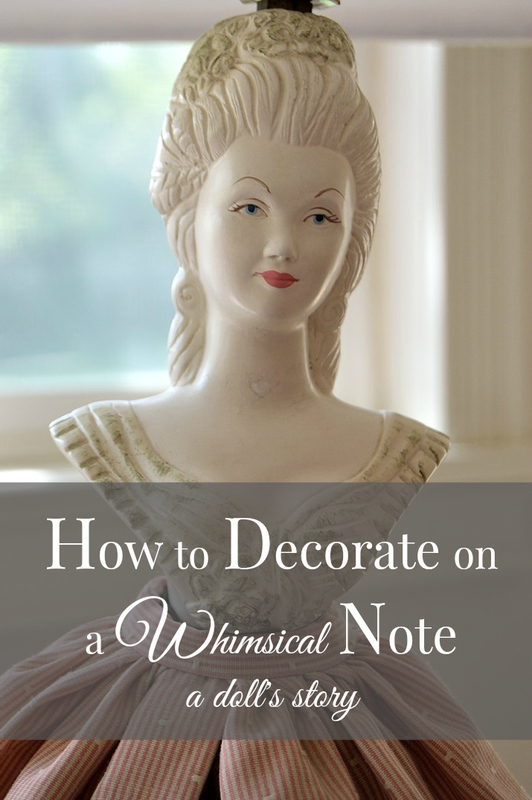 Using whimsical elements when decorating, especially those things with personal meaning, gives your home character and individuality, and keeps it from looking like a furniture store showroom, which, let's face it, as nicely done as they can be, tend to be a bit sterile. 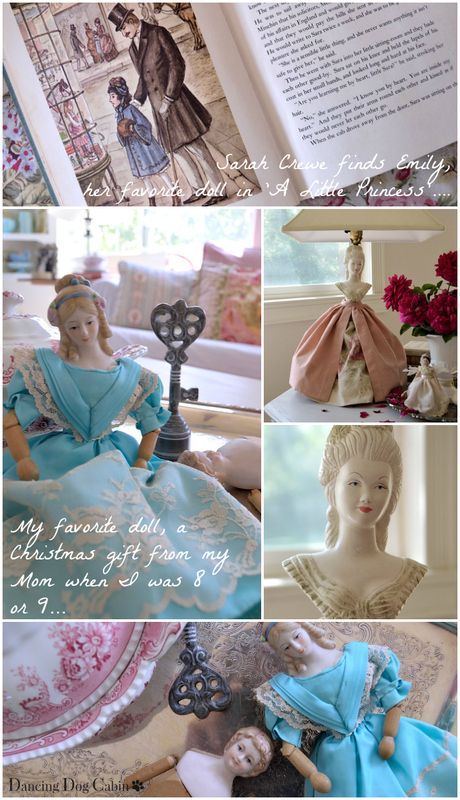 In this case, I'm demonstrating how I use a childhood love, dolls, to add a bit of whimsy and playfulness to my home. I was crazy about dolls when I was little, and to a certain extent, the little girl in me still wants to play with them. I had all sorts of dolls-- a whole tribe of Barbie dolls, Raggedy Ann dolls and other cloth dolls sharing my bed with an impressive menagerie of stuffed animals (another childhood obsession), a collection of dolls from around the world, old fashioned dolls with china heads....Like the doll characters in some of my favorite books, all of them peopled an imaginary world, where each became a character with his or her own personality and motivations (I used my shoes as Barbie cars; my favorites got to 'drive' my roller skates). 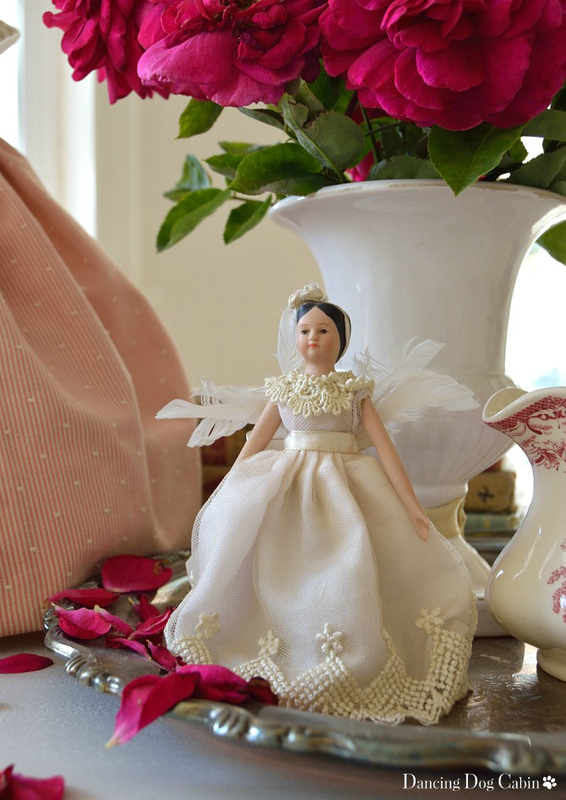 Today, the little girl in me still wants to play with dolls... however, using dolls when decorating can get tricky. 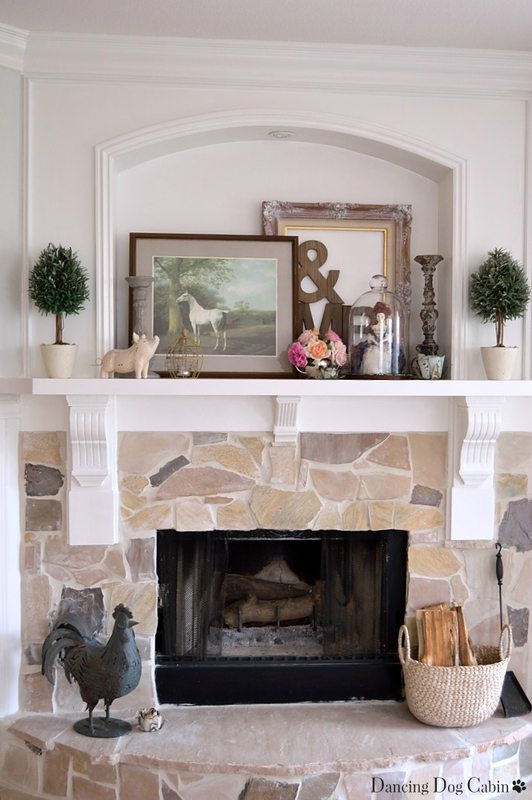 I don't want my house to be over-the-top-fluffy little girl feminine, since that is not my style, and I need to keep my husband, who gets antsy when surrounded by too much frilly-ness, in mind as well. 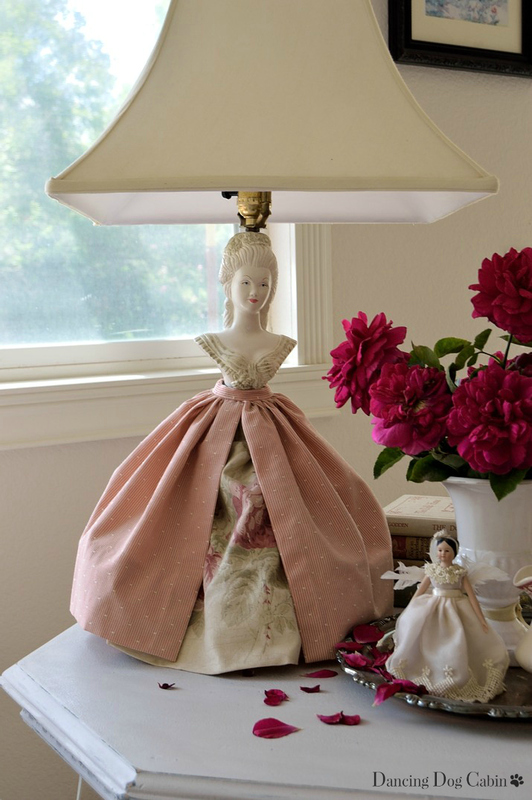 Let's start with Lady Lamp....she and her twin sister (who, I'm sorry to say is still hiding in a closet) came home with me from a shopping trip at an antique mall wearing dirty, tattered pink tulle skirts and matching hats/lampshades. For this one shown here, I ripped all that off, gave her a new lampshade and sewed her a new skirt using scraps of decorator fabrics that coordinate with the rest of the living room. Instant fun in the living room! And what makes it even more fun is that the skirt is removable thanks to a snap closure in back--so I get to play 'dolls' with my lamp by putting her into a new outfit to suit whatever changes have occurred to the decor of the living room. I was lucky to get these two lamps, for the faces are very pretty-- which isn't always the case for lady lamps. Currently she shares the table top with her little angel friend... another doll inspired item....and a stack of books that includes some childhood favorites, and that are, of course, about dolls or little girls who play with dolls. 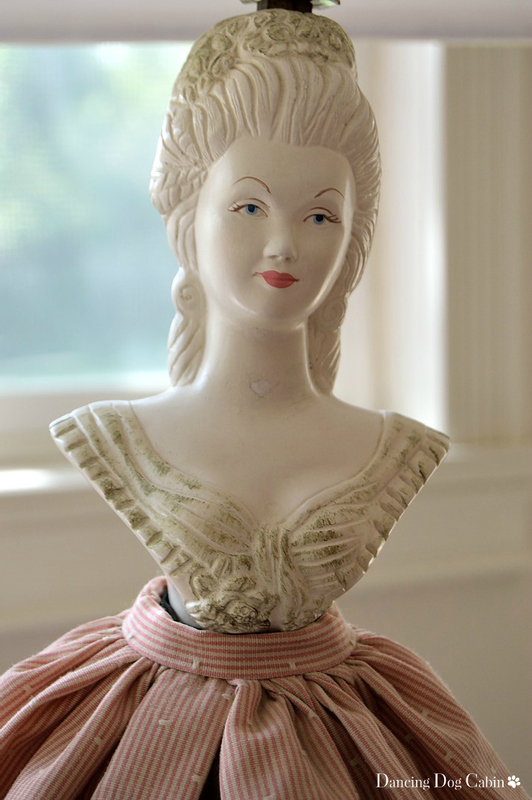 One of my favorites, a doll I patterned loosely after Francois Boucher's depiction of Madame Pompadour in a painting called Madame de Pompadour, has recently taken up residence on my fireplace mantle, which is located in our decidedly more masculine family room. How do I make this work here? The prettiness of the doll, the pink roses, the ornate pattern on the picture frame and candle holders is balanced by the straightforward, rustic texture of the metal votives and rooster and the graphic wood letters, not to mention the bucolic, rural elements contributed by Mr. Piggy and the horse painting. 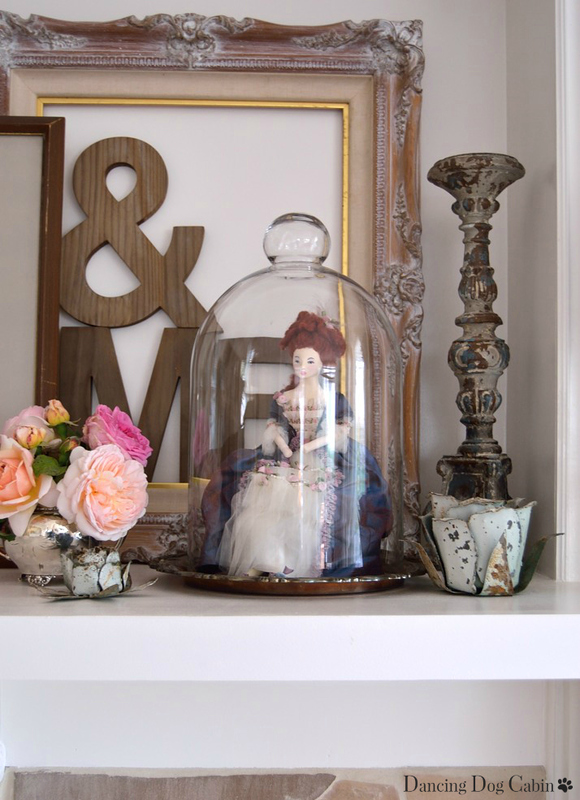 Displaying 'Madame Pompadour' in a bell jar in this setting turns her into a visually interesting focal point and keeps the whole vignette from looking like a little girl's room. 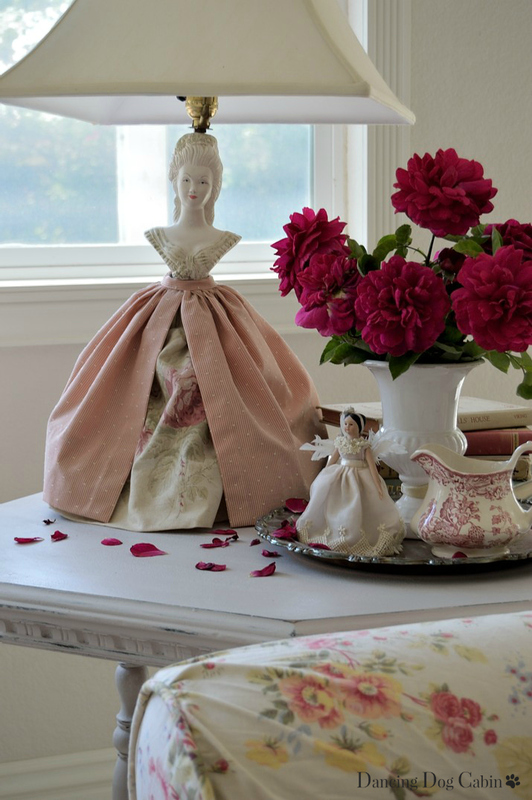 What a beautiful post, and I love the ideas you offer for using the dolls in a way that doesn't make it "too" feminine. . .I am challenged by the same, as I moved into my husband's home 10 years ago and he already had the masculine look going. Fortunately, he does appreciate art and antiques, and does not mind my influence. 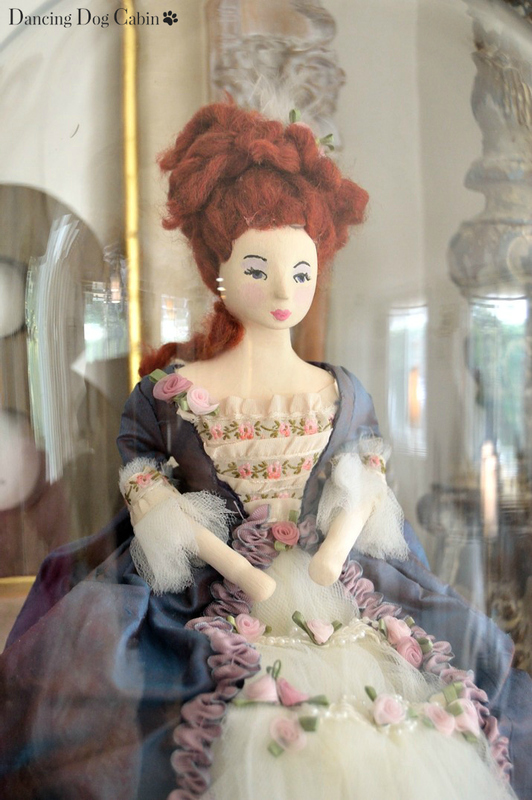 Your photos are really pretty, and I am inspired by how you placed one of your dolls under the glass dome. I may "copy" this. New follower. . .
Cynthia, thank you! I'm glad I was able to inspire you. Yes, it's definitely tough to meld your style (if it's more feminine) with a man's more masculine style. 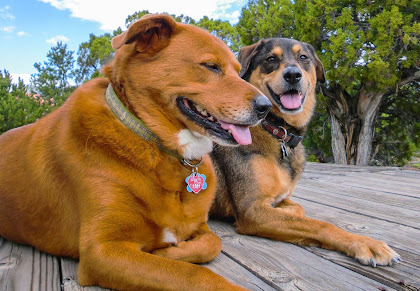 I'm thrilled to have you as a new follower! Thank you! And thanks for following me-- how nice to have a Canadian follower. 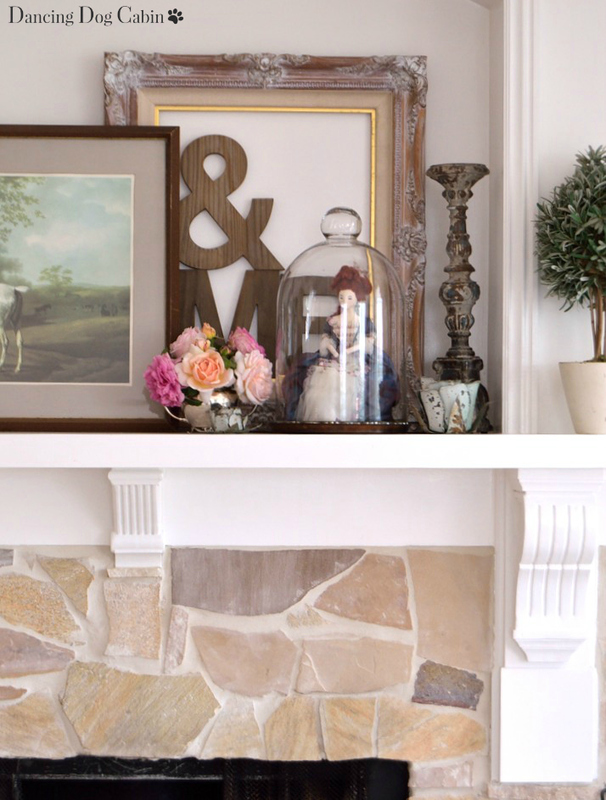 Great tips for balancing feminine decor, Melissa! Your Lady Lamp is so pretty, and I love that you can change out her skirt. 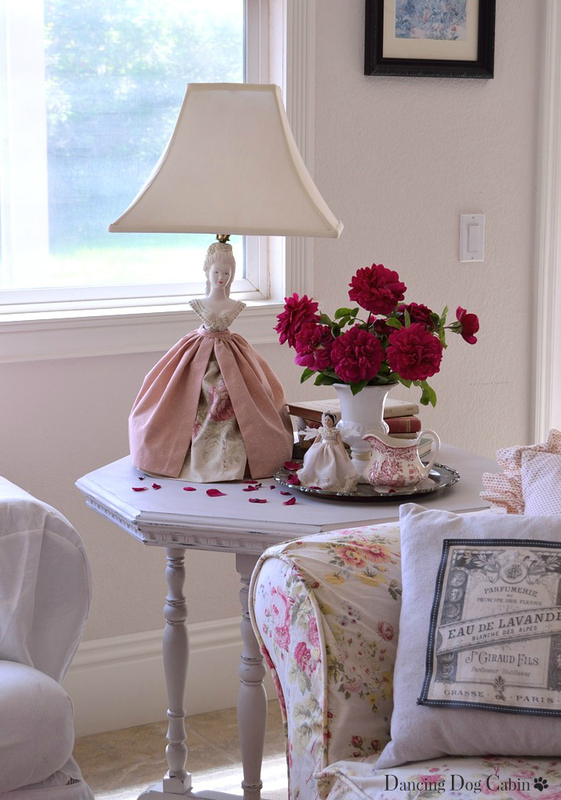 How beautiful, I love the idea of adding a little whimsy to the decor. Thanks Kimberly! I'll see you at the next Fabulous Party link up (if I can get my next post finished). I love all of your pretty displays! That is just wonderful! 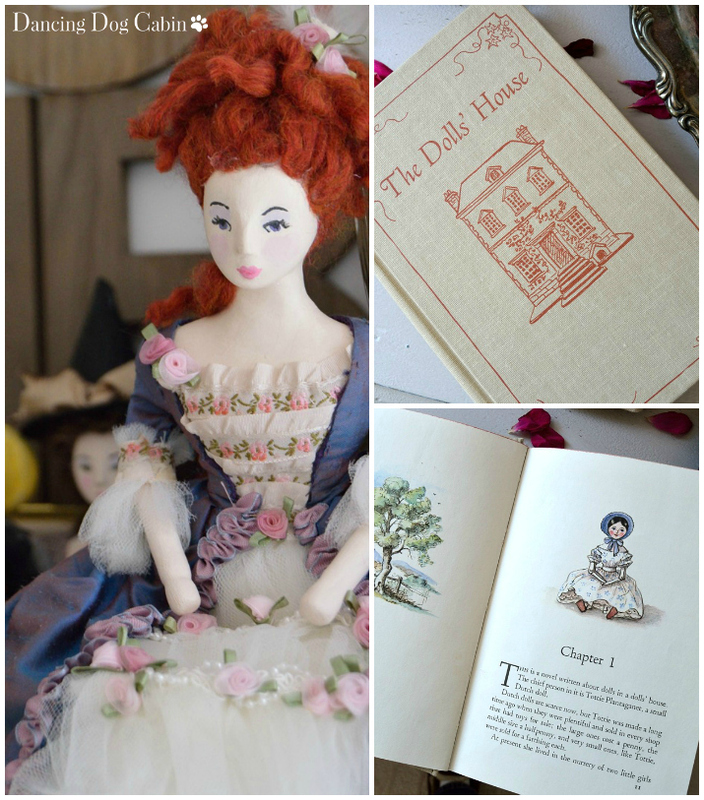 I love the doll under the cloche! Thanks for joining Home Sweet Home!